A 4-in-1 Can and Bottle Opening Tool. One opener to rule them all. This 4-in-1 bottle and can opener can make quick work of opening virtually any lid. Unique design and a bold look make it a cool tool to have, but it's versatility and usefulness make it a must have kitchen gadget that will be used time and time again. The Parrot opens cans and bottles in four fun ways. Flip tops, pull tabs, pop tabs, and threaded caps all yield easily to this great opener. The integrated rubber handle insert, and ergonomic design make this bottle and can opener easy for anyone to use. The soft grip adds comfort and reduces strain, while the large handle and unique shape make this tool incredibly easy to handle. 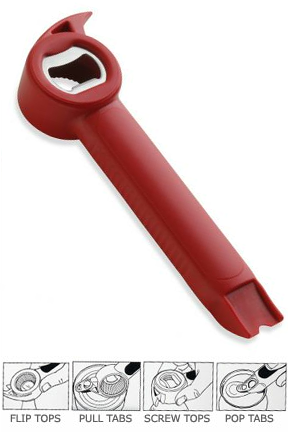 Use it with great success to open beer and soda bottles, plastic bottle caps, pull tabs on cans and much more. This is the fastest and easiest way to open almost any bottle or can. From pop tops to screw tops, cans and bottles alike. There is no match for the Parrot 4-in-1 opener. Dishwasher safe. Red. A classic "church" key opens flip top bottles. Simply slip the "beak" into the loop. Then rock back and pull to open. Place "eye" over the bottle top. Grasp the tool's head firmly and twist counterclockwise to open. Slide the notched end of the handle under the tab. Then hold the can firmly and lift to open. Another high quality kitchen gadget form Kuhn Rikon. Stop using multiple tools to open different kinds of bottles and cans. The Parrot can handle them all. The Parrot is a 4-in-1 opener that can open virtually any bottle or can. It is compatible with all of the common lid types and makes opening them easy. Swiss design, high quality materials and superior construction ensure you will get years of use out of this great tool. Make the chore of opening bottles and cans quick and easy. Order Yours Today! Overall Dimensions 7" x 2"
The Parrot by Kuhn Rikon - High quality materials and superior craftsmanship make this Swiss made kitchen gadget a must have. A great accessory for anyone that enjoys cooking. Discover the easiest way to open virtually any bottle or can. Wonderful tool. Helps with so many things ! Speed & Quality Combined. The Same Flavor & Tenderness In A Fraction Of The Time! A Large Set That Includes All Available Attachments.